Austin (The Balding Eagle) Miller, originally from Herndon, VA, graduated from High Point University in 2016 as a the School record holder, 4x Big South Conference Champion, Conference Championship record holder, and 2x NCAA first round qualifier with a college PR of 5.25m (17’2). Sean Young from Titusville, FL . University of South Florida Grad with a degree in Criminology. Big East Champion in 2008, competed at the 2008 NCAA Championships, also competed at the USA Championships in 2013. Is the current Key West island record holder at 17’1″. And has a PR of 18’2 3/4! Scott Houston is the 2018 Indoor National Champion where he set a PR of 19’1.5″ This victory also earned him his first Team USA birth. Scott is a 2018 World Indoor Championship Finalist and the NACAC Champion for USA in 2018. 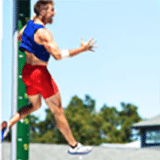 Scott works as the vertical jumps coach at High Point University and has been training and coaching at High Point and Vaulthouse since 2015. 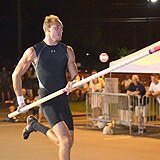 Scott is also on the board of USPVA, an up and coming organization with the mission to help give the sport of pole vaulting a voice. 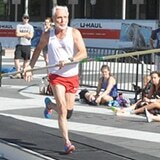 After 35 years away from the sport, Steve Hanes took up pole vaulting again 5 years ago. Steve competes in the Masters (60-64) Division where he is currently ranked no. 10 in the USA and no. 12 in the world with a jump of 3.35m (11′). Steve still holds his high school record of 15′ (Ottawa, Ks) and was a five-time Kansas State Champion as well as twice the National Jr. Olympic Champion and age-group national record holder. Steve currently resides in Key West. 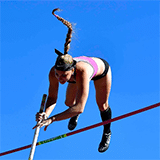 Originally from Palm Coast, FL, Taylor Drummonds attended East Carolina and Appalachian State where she set school pole vault records at each college. Her degree is in Speech and Hearing Sciences and is currently completing her prerequisites for medical school while training in the mountains of North Carolina. 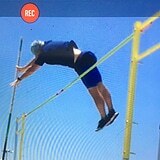 Taylor’s personal best is 4.15m (13’8”). Garrett Starkey is from Queen Creek Arizona where he trains in his own backyard. He was a two-time Arizona state champion in 2011 and 2012. He graduated from Stanford University in 2016 with a degree in human biology. He finished his last year of eligibility at Arizona State University while he completed a master’s degree in Exercise Science. In 2017 he completed his college eligibility by earning second team All American at the NCAA Championships. Last year Garrett began his first post collegiate season with a personal best of 18’4.5″ and a 9th place finish at USA Nationals. Sean Clarke was a three-time Florida state champion from Lyman High School in Longwood, Fl. and is currently a junior at the University of Pennsylvania where he studies mechanical engineering. 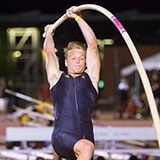 Sean is an Academic All-Ivy Vaulter and two-time USTFCCCA All-Academic. As a freshman Sean placed 15th at the NCAA Outdoor Championships earning Second Team All-America honors. 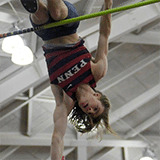 As a sophomore he won the Outdoor Ivy League and IC4A Championships and achieved a PR of 5.50 (18’.05”). Tray Oates won 2 George State High School Championships and set the 5A Georgia state record (16’1) while living in Acworth, GA. In 2018 Tray graduated from Samford University with a B.S in Foods and Nutrition with an emphasis on sports nutrition. 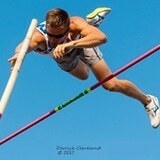 At Samford Tray was a 5 time NCAA D1 All-American and 4 time US championships qualifier. He finished 4th at the 2016 US Olympic Trials and was the alternate for the 2016 Olympic Games. Tray’s PR is 5.66 (18’6.8”). Tray currently lives in Phoenix working as a bartender and coach to help support his training for world championships and Olympics to come. Jill Marois has improved significantly since her high school PR of 10’6”. At High Point University Jill was a 3-time Conference Champion and a 2016 US championship qualifier with a collegiate best of 13’10”. Jill graduated from High Point with a degree in psychology and a minor in coaching. Jill continues to improve with an after college PR of 14’7” as she continues to train while coaching part time and working two jobs. 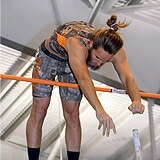 Howard Booth is currently the #1 ranked pole vaulter in the World in the M75-79 age for the 2019 Indoor Season and had a #4 ranking for the 2018 indoor season. Howard has won two age-group World Championships in the last eight years in addition to a number of USATF, National Senior Games, and Canadian National Championships.